Yes. Underlayment for laminate flooring provides proper support, stability, noise reduction and helps the click lock system to provide a structurally sound floor. With many different underlayment options and flooring types available to the consumer, we will list the benefits of underlayment and what to look for in underlayments. Why do you need to worry about moisture for your flooring? Laminate flooring is made out of composed resin and fiber board materials with a photographic applique layer under a clear protective layer. If moisture from your subfloor (concrete or wood) get to the fiber board material, your flooring will absorb the moisture and start to bow or warp. Underlayment with a built-in vapor barrier provides the protection you need from moisture. Cement is a porous material and can absorb and emit moisture. If your installing laminate flooring aka floating floor can be at risk of absorbing moisture from your cement subfloor. Installing an underlayment with a vapor barrier or 6-mil vapor barrier in addition to underlayment will stop all moisture from getting to your floor. Moisture really wouldn’t be a concern here unless you are installing it over a crawl space. We recommend to install a vapor retarder below in your crawl space to eliminate moisture problems. Adding a 6-mil vapor barrier on top of the subfloor of a crawl space can block the moisture of your subfloor and cause rot in the long haul. No underlayment can fix the issue in the crawl space. Noise can come from all directions, pets, crying baby, loud steroes, kids playing…you name it. Underlayment can help absorb vibrations from one’s daily noise and block out the noise from other rooms. Our recycled felt underlayment absorb sounds and keep it from traveling to other rooms. Individuals who installed QuietWalk comments their laminate flooring sound more real like hardwood due to the QuietWalk underlayment installed. Having compression resistant underlayment allows a structural foundation to your floors. Normal to high weight stress-loads allow your floor to naturally flex. Compression resistance also allows to hide minor subfloor imperfections and protect the click lock mechanism to provide a solid foundation. Insulating is usually thought of adding to walls, roof, windows and doors. However your flooring can cause heat gain or loss. Flooring underlayment has some type of R-values that help improve your comfort underfoot. Choosing an underlayment that provides a higher R-value towards 0.5-0.6 helps keep you comfortable, lower your energy bills, and you’ll enjoy the space even more. We wanted to add clean indoor air quality to the benefits as it is the last and unseen benefits most homeowners think about. As most DIY homeowners installs their underlayment, they might notice a harsh odor. This could most likely be coming from their underlayment. Thinking it might go away overtime and it might, but still can give off-gasses of harmful chemicals. Maybe one of your family members start getting sick more often. We recommend to always look for some valid certification of no VOC off-gassing of your underlayment you choose. QuietWalk currently has Green Guard Gold certification allowing our underlayment to be installed in hospital or government buildings. Having an additional underlayment under pre-attached underlayment has homeowners concerned about having too much cushion potentially to destroy the integrity of the locking system and cause the floor to become unstable. With our felt/fiber underlayment (QuietWalk), we designed the underlayment to be dense and to support the locking system of any laminate flooring. 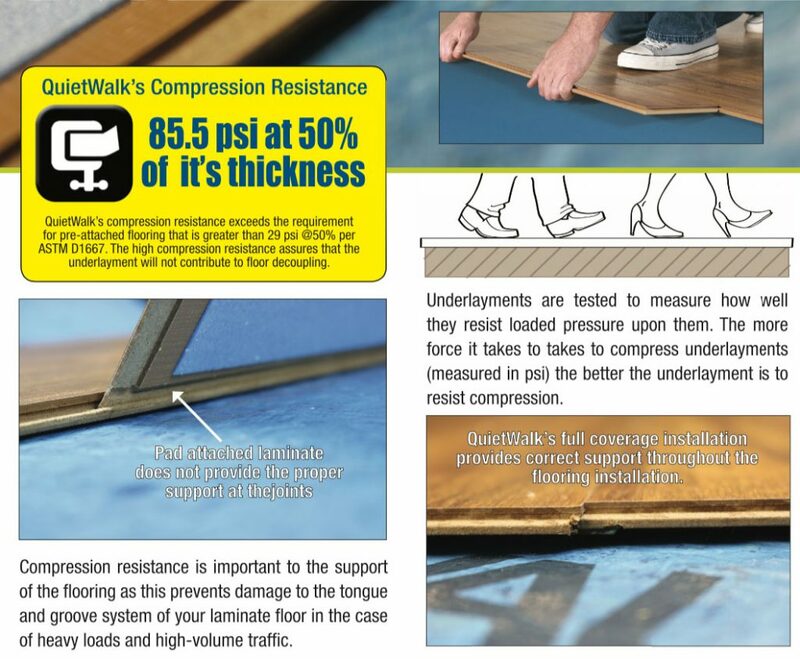 QuietWalk’s compression resistance exceeds the requirement for pre-attached flooring that is greater than 29 psi @50% per ASTM D1667. The high compression resistance assures that the underlayment will not contribute to floor decoupling. Disclaimer: Please read your flooring manufacturers installation instructions. Most manufacturers will not accept additional underlayment under their pre-attached underlayment due to increase of claims. 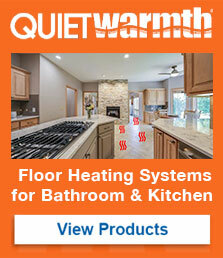 With over 20 years, QuietWalk has been the leading underlayment for laminate flooring installations. If you have any quesitons, please let us know either by email or call us at (888) 379-9695.